Catholics gener ally don’t think of Jesus as an evangelist per say, but rather a storyteller. Well, the Son of God understood parables are powerful vehicles for truth. Since parables impact people when they can relate to the details of the story, Jesus told stories about the ordinary people of His day. 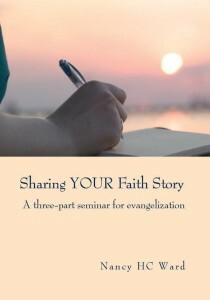 Nancy Ward also understands when people simply tell their personal journey of faith in their own words, they can help others who are seeking an authentic meeting with God. Ordinary people can reach, or evangelize, many who are outside the traditional Church.